Back when I was doing my research on cutting and sewing sweater knit fabrics, one woman, who'd worked in the fashion industry for decades said to me, "You know, you can just use your serger to cut out your pattern pieces. Then you don't have to worry about fraying." Hmm, well, it sounded logical. 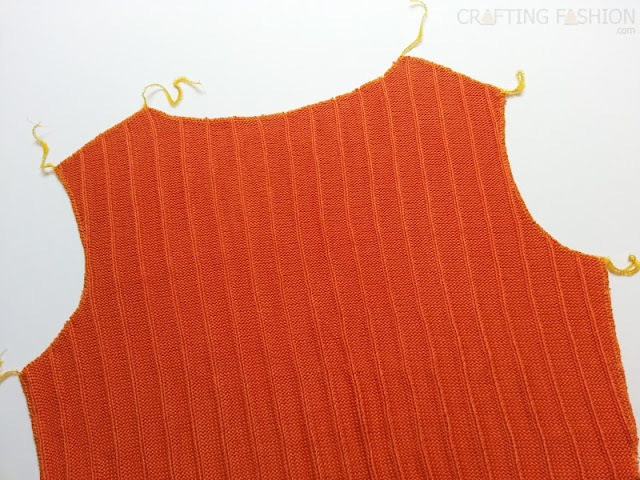 I knew that machine knitters often cut out necklines that way. But a whole sweater? It's been about a year now, since I first heard of that technique. No one else has ever offered that suggestion! I've finally decided to try it out on the Tangerine Top. I started by carefully placing my paper pattern piece on my fabric. I held the pattern in position with weights and traced the paper pattern using my Collins Air Erasable Pen. You can see the traced pattern piece below. Lining up the purple line with the blade of my serger, I used a 3-thread serger stitch to cut the shape and finish the edge at the same time. Before serging, I spent lots of time adjusting the differential feed to be sure the edges, especially the neck and armholes, did not stretch. The back piece has outside pointing corners, which were easy to serge this way. I can see where this method might be useful if you were seaming very thick fabric and couldn't fit the double layer of fabric under the presser foot of the serger. 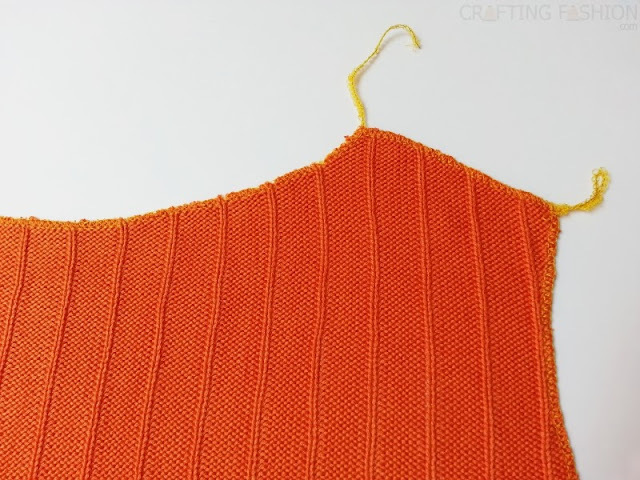 With this method you only serge through one thickness of fabric at a time. The plan now is to cut out the front in the same manner. I'll use a contrasting facing for the neck with interfacing perhaps for the asymmetrical front. Binding will be used for the armholes. I'll stitch the pieces together with my regular sewing machine -- no need to stabilize edges any further. All I need is a little time to finish! If anyone else has experience cutting out your pattern with a serger, please share in the comments. It seems so quick and easy! Any drawbacks I haven't anticipated? After tracing the outline of your large piece, sloppy cut the piece first before bringing it to the serger. In other words, pre-cut the piece to separate it from the rest of the fabric, leaving roughly 1-inch of extra fabric beyond the seam allowance. 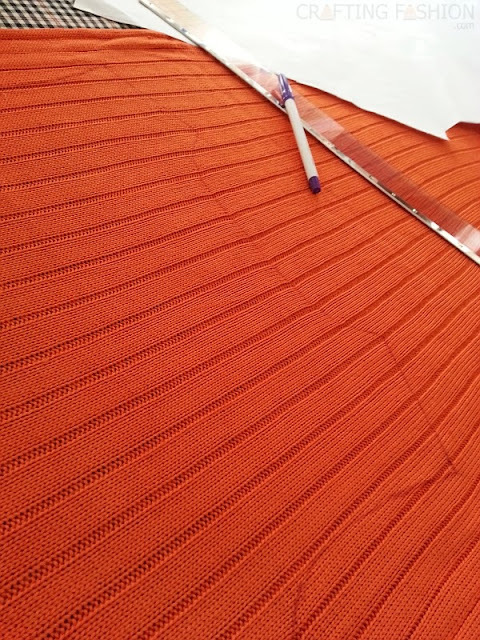 Your cutting doesn't need to follow every curve of the pattern piece, just enough to separate it from the rest of the fabric and to make it manageable. Then use the serger, following your traced outline, to trim to the seam allowance. thanks for this post - this is the way I had planned to do my cut and sew - it seems to make a great deal of sense to me. What keeps the large pieces being cut off from balling up by the knife. Jingles, I assume you mean the scrap or waste fabric "balling up" as you overlock the pattern piece? 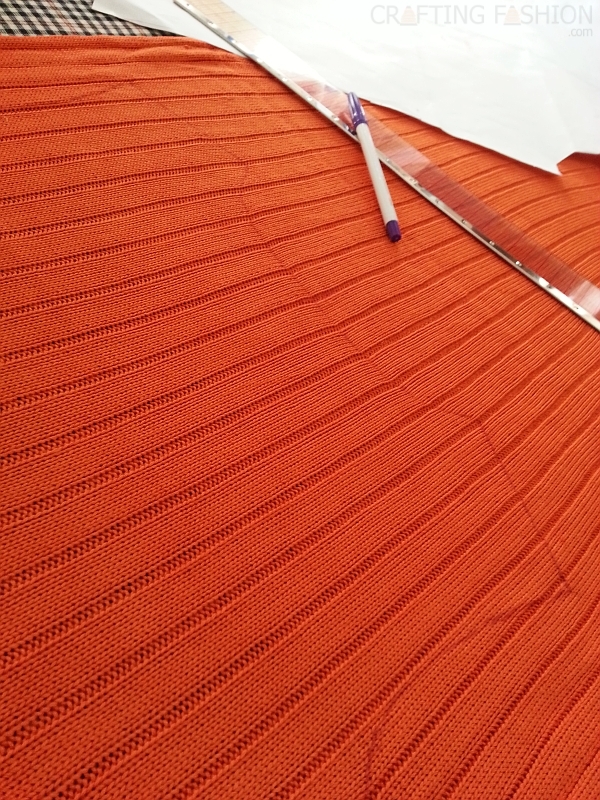 After tracing the outline of your large piece, sloppy cut the piece first before bringing it to the serger. In other words, pre-cut the piece to separate it from the rest of the fabric, leaving roughly 1-inch of extra fabric beyond the seam allowance. 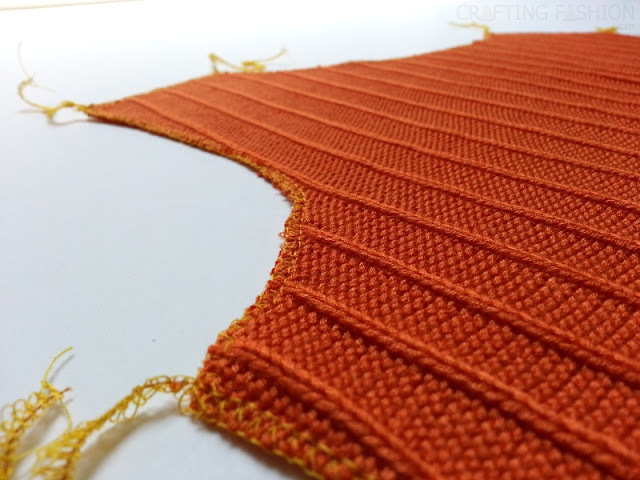 Your cutting doesn't need to follow every curve of the pattern piece, just enough to separate it from the rest of the fabric and to make it manageable. Then use the serger, following your traced outline to trim to the seam allowance. Let me know if you have further questions. By the way, is Jingles a nickname? That was my childhood nickname. My relatives and people who knew me as a child still call me that!